FileMaker discontinues it’s product Bento as reported by Macworld in late July 2013 because of focussing on their main products. If I’m right withdrawing an app by a big company is a unique event in the App Store’s history and pretty bad news for users of Bento 4 on mobile devices. On my point of view it’s a consequence of bad success caused by ignoring indispensable features for databases on iOS devices. For example you cannot create your own database without using the desktop companion application. Establishing a connection to a cloud storage for importing or backing up data is not possible. So all the missing key features of databases for mobiles maybe the real cause for withdrawing Bento 4 from the market. All along developers fail if a precise analysis of user requirements doesn’t take place. This post is about a newcomer in the market of mobile database management. It’s zBase by SourceGear, LLC, USA. Eric Sink, one of the owners of SourceGear sent me an E-Mail in July 2013 in which he presented the new product (version 1.0.1). zBase is a very new product, but we think it is a strong offering for small business users. Your feedback or suggestions would be much appreciated. The app is universal (runs on iPhone and iPad and fits in with the iPad’s form factor) and free but only if it runs in the so-called Demo Mode. All features which require server access are disabled, including syncing across devices (zBase is built on Zumero, a database sync platform for mobile apps), user authentication, user management, and encryption of data. At the time even a migration of already -in demo-mode- stored data to a full version with Zumero platform subscription is not supported! Is this the right strategy to get new customers or convert others to this new product? I mentioned this problem in an E-Mail and argued that I already pay for an upgraded iCloud account. So why should I subscribe for an additional storage at Zumero’s platform? My favorite app Tap Forms uses iCloud and syncing it’s SQLite database is a seamless and flawless task. After a one week trial with zBase my favorite app still remains TapForms by Tap Zapp Software Inc., Canada because zBase is still in a developing phase with too many flaws and missing features. It might be not fair to compare a new app with an app continuously upgraded over years since the launch of the first iPad in 2010. But from the users side it’s good to know the pros and cons. 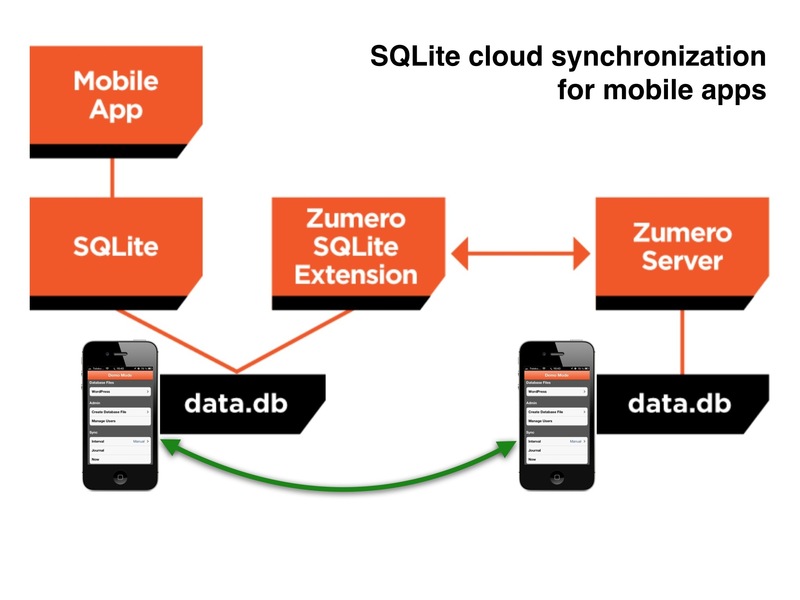 Both apps are based on an SQLite database engine and claim to serve businesses. So zBase has to face up to the comparison. Here is a mind map with a description of all features of zBase. 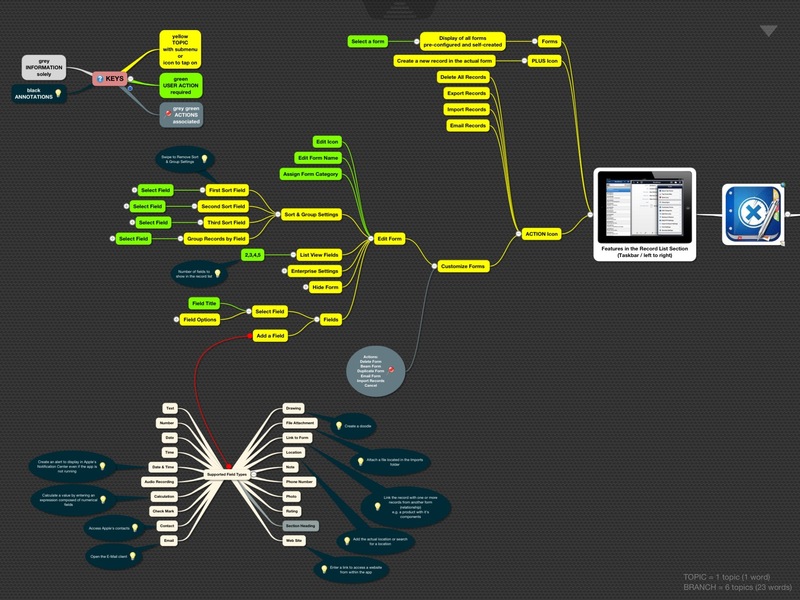 To compare zBase with Tap Forms HD here is the mind map visualizing all features of Tap Forms. 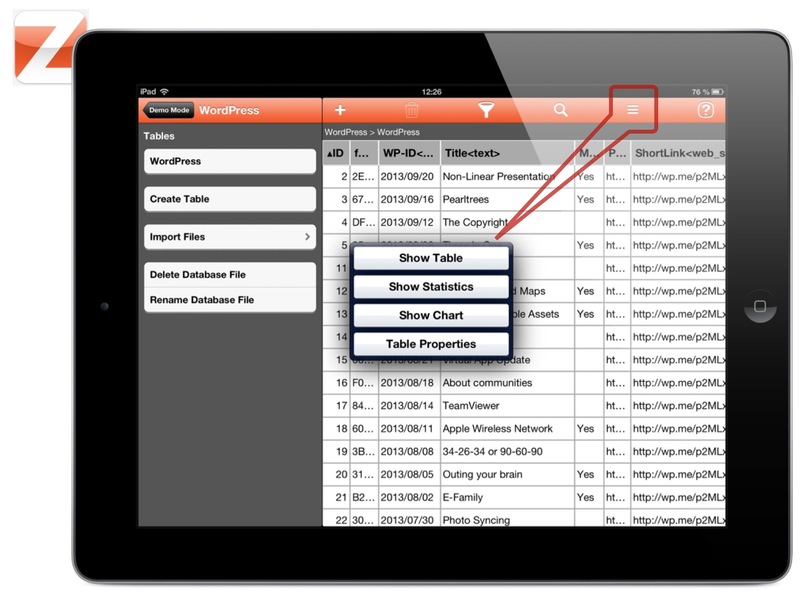 Tap Forms sets the standard for databases on mobile devices. 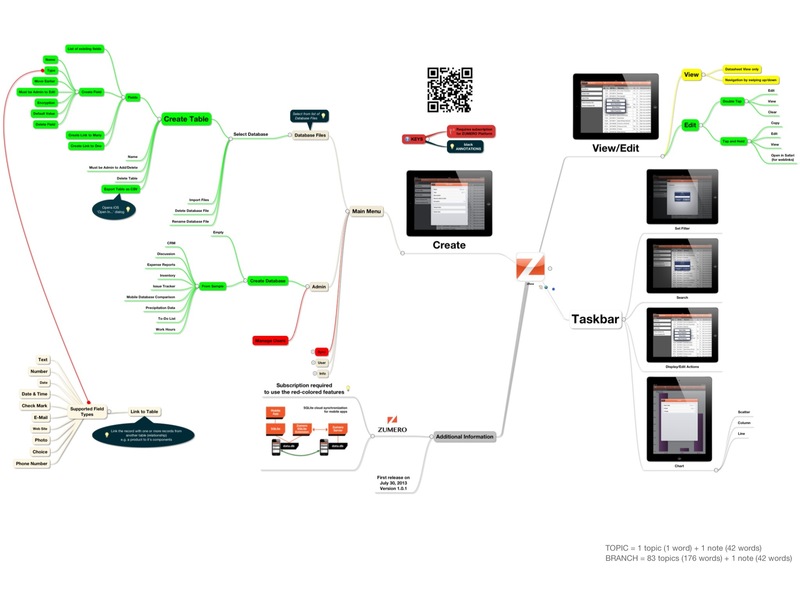 So I created a mind map summarizing the key features of databases on tablets and smartphones. All the other database tools have to compete with these features. This gallery shows zoomed parts of the mind map. Because of the different design concepts regarding external storage and data view it’s hard to compare zBase with the key features visualized in this mind map. The app zBase comes along with a table named ‘Mobile Database Comparison’ which compates zBase, Tap Forms, Bento, and HanDBase. I took off Bento (discontinued after Sep 30, 2013) and HanDBase (no experience with this from my side), reduced the list to some relevant points, added missing information about Tap Forms. Regarding usability let me explain why Tap Forms gets a positive and zBase a negative rating. This is just one example for low-level usability but it’s basically valid for nearly all features of zBase. Releasing apps in an early stage of development is always a risk. Users generally should use these apps just for a field test. Nobody can be sure that indispensable updates will follow in a narrow timeframe. Entering data is one task when working with databases. This view is used by zBase. This view is used by Tap Forms. The form itself can only be modified by using different colors or fonts for field names and content and by setting the order of fields. Fields are always positioned one below the other and cannot be positioned in a free-floating layout. 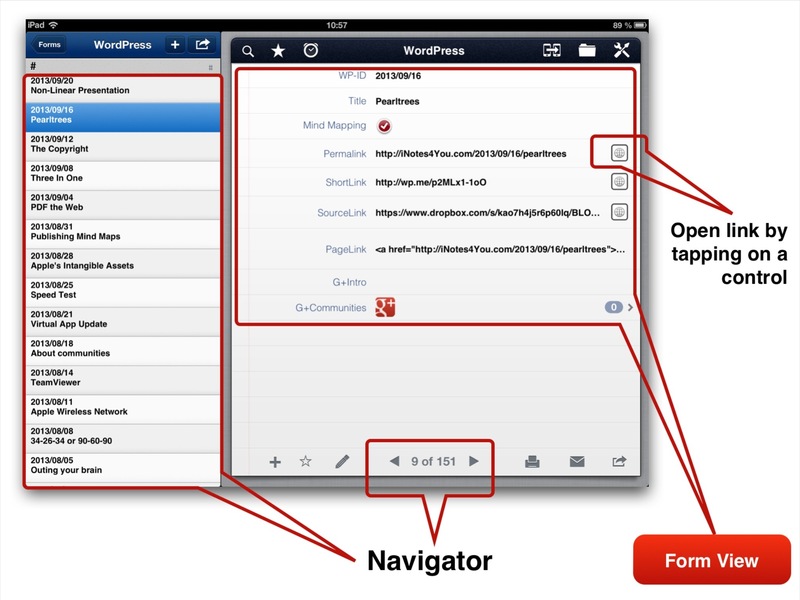 A useful feature of Tap Forms is the choice of field content shown in the navigation list (up to 5 fields). Additionally there are GoTo controls for navigating through records (first, next, previous, last) available in the iPad version. Long-press on the field name (column header). When you release the long-press, the column header will become highlighted with a different color. This signifies that the pinch gesture will now resize the width of that column instead of the row height. 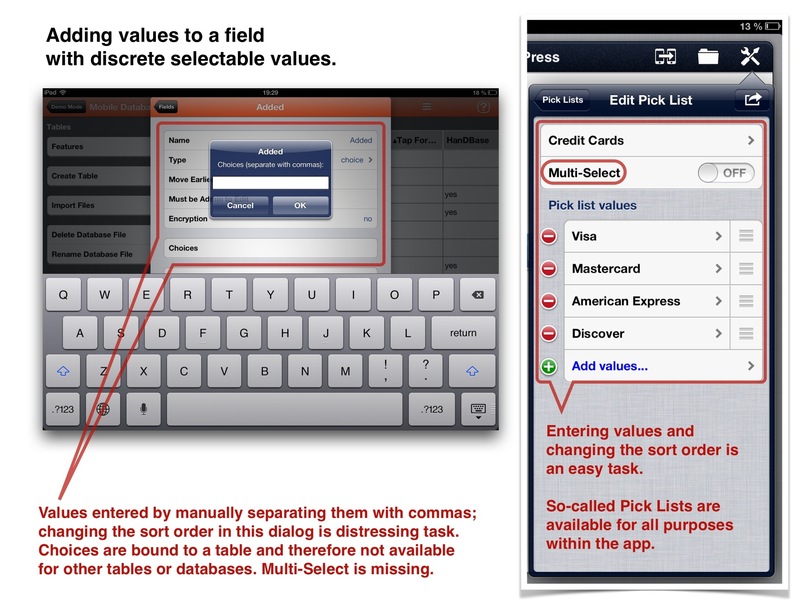 In the datasheet view, if you tap on the field name (the column header), it will sort the records by that field. Complete backups of the device via iTunes or iCloud is by far no appropriate solution. When backing up databases by exporting tables as CSV files all contents in fields with type ‘image’ get lost. This limits the usage of the import function in an unacceptable way and it took additional rework on all of my many sample files. None of them used the unusual comma for separating fields. The company promised to fix this flaw. There are several ways this could be going wrong. The current search is a keyword search. It matches whole words. So, if a data value is “send more beer to the king”, and you search on the word “beer”, it will match. Also, the search feature currently only searches field of type ‘text’ (not ‘web’), so if your URLs were in a field of type ‘web’, the search would not find them. We will work to make this feature friendlier. I agree that the behavior you are seeing is not very intuitive. This is useful to separate important from less important contents. Filtering data is not supported by a selection of a field name or an operator. The expression has to be entered manually. I recognized some crashes of the app while tapping on controls. An app crash also occurred after importing 65,000 records from a CSV file. I informed the company about these issues. At the time zBase -in contrast to the developer’s announcement- is far away from being a business oriented database application for mobiles. Some good ideas go along with a definitely not acceptable support of data entry (e.g. using a single determined character to set the field format). In some cases with simple tables and less fields a datasheet view might meet the requirements. In many other cases it’s not a suitable solution especially if a table contains a field of type ‘image’. 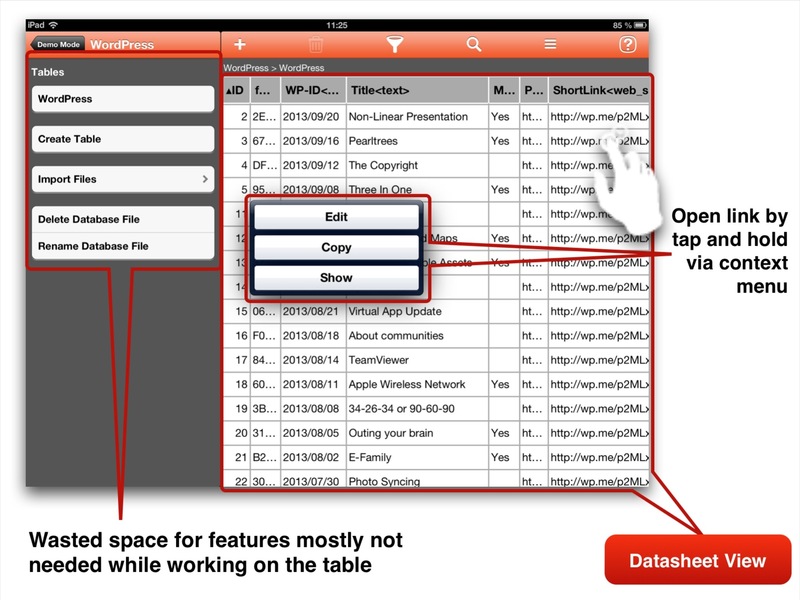 If you compare the features of Tap Forms with those of zBase there is much work for the developers to bridge the gap. Last but not least the pricing will not be accepted by private users. It might be accepted by business users but there is no desktop companion available. I’m in serious doubt about the success of this application in the mobile app market.